2. Hey Robert, what’s the first poem you remember blowing your mind? One of the reasons I love poetry so much is that it blows my mind so often. Thankfully, there is always a steady stream of poems just waiting to explode my preconceptions, and/or express something I previously considered inexpressible. Soon after that, the next poem to do that was a poem from Raymond Carver’s Aquamarine, “The Autopsy Room.” Obviously, Carver is acclaimed for his fiction, and it seems like his poetry is sort of a footnote, but for me, as I was discovering the literature I loved, it blew my mind similarly to Ginsberg’s work. I had never seen something so direct. In the end, I think that one-two punch of discovering Ginsberg and Carver within the same year made me realize what I really wanted–something visionary, but in a direct, concrete manner. So when I read Denis Johnson’s The Veil a few years later, in college, it not only blew my mind, but changed me from loving poetry and having fun writing it into someone who wanted to devote a life to it. If Ginsberg and Carver blew my mind, Johnson showed me where I wanted to go now that it was. It’s hard to narrow down to one poem from that book, but I think “Man Walking to Work” was the one that crystallized everything I loved about his work so much. I still have the copy from way back then, and it is still bookmarked from those days. Even now, when I read it, I feel like it is a command to go create. 3. Hey Robert, what’s the last great poetry book you read? Most recently, it was Norman Dubie’s latest, The Quotations of Bone. I first read his poems over two decades ago–and he is still putting out work that floors me. 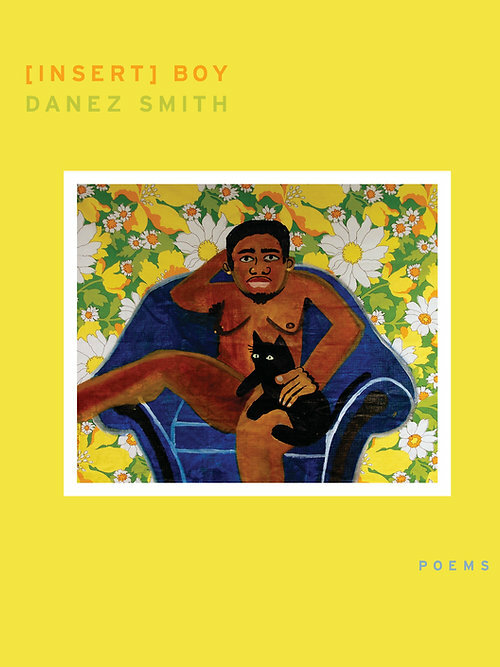 Also, even though I got it a year ago, I keep returning to Danez Smith’s [insert] boy. It’s the sort of book that you love instantly, and gets better and better, read after read. Just amazing. Finally (and I know I am now on my third book for a question that asked for a single title), I have to mention the late Barry Spacks’ final collection, Shaping Water , which just came out. My poem “The Branch” here on A Dozen Nothing was written for him, initially for a celebration of his life on UCSB’s campus, where we taught together. Barry was a warm, wonderful poet and teacher–not surprisingly, his final book has those same qualities. 4. Hey Robert, any books on poetry you’d recommend? I think this qualifies as a book “on poetry” as well as poetry itself–the recent anthology Please Excuse This Poem is one of the best collections of its nature that I’ve read. It’s a fantastic representation of current poetry from all of its angles–there are simply so, so many great pieces in it. In addition, as a teacher, I have seen firsthand how its selections and scope affect students, having used it in recent classes. They, and I, found so much to love in here. 5. 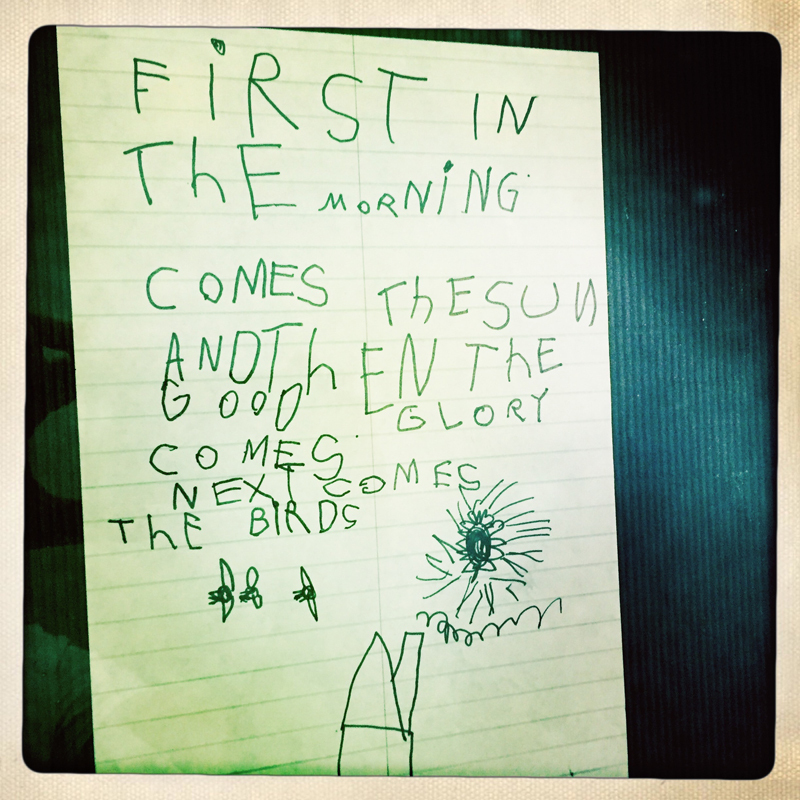 Hey Robert, any artwork that inspires you to write? Absolutely. On my last book, there were a handful of paintings that either inspired–or focused–the manuscript. Paul Klee’s, “Possibilities at Sea” became a sort of beacon as I finished the collection. More recently, the great artist Chuck Webster stayed with us during the opening for his LA show [ http://www.zevitasmarcus.com/exhibitions-all/bulldog-skin%5D and simply watching it come together, and taking in all the paintings as a whole, was particularly inspiring–and such an obvious parallel to putting a collection of poems together. 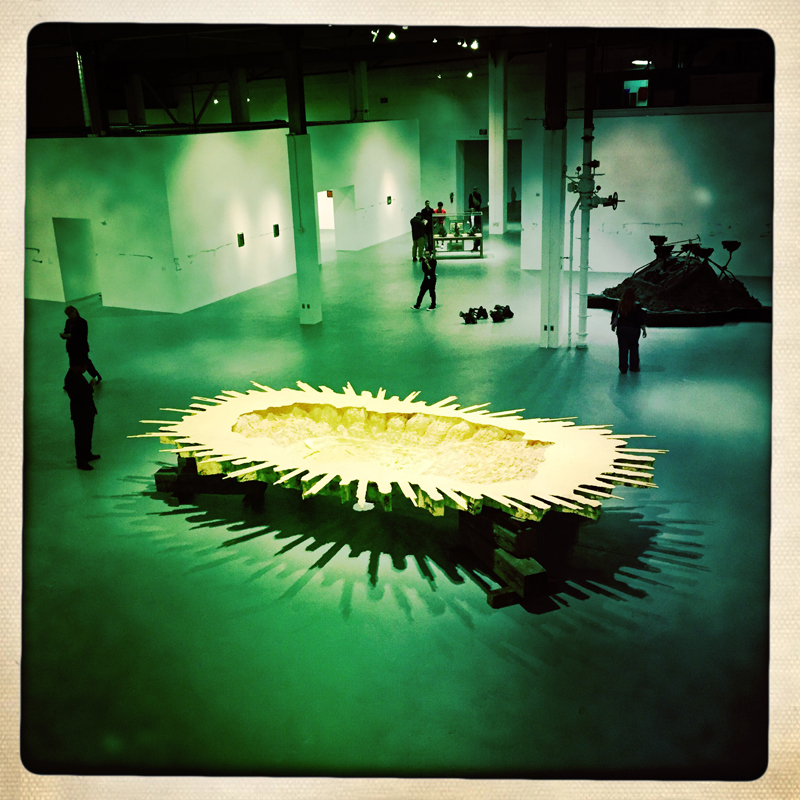 In a more direct manner, during that visit, we went to Matthew Barney’s River of Fundament at LA’s MOCA [ http://www.moca.org/exhibition/matthew-barney-river-of-fundament ]. I know taking pictures inside a show like that is a little tacky, but I couldn’t resist grabbing a shot of one of the pieces from the installation, because I could feel it was going to spark something for me–which it did. 6. Hey Robert, could you tell us about the first poem you wrote? 7. Hey Robert, what’s the best piece of writing advice you got? I don’t know if this is the “best,” but it is “advice”: read a lot, and try your best to read a lot outside of your usual choices. Don’t always fall back on the same style, voices, subject matter, names, and approaches. Read something that you might not automatically pick off the shelf. You’ll always have your favorites, but your vision can get really limited–as can your writing, of course–if you just read the same type of work over and over. And I say this as someone who sees the benefit in it, but also has to remind myself of it sometimes. There have been days when I’ve looked at my bookcase and thought, wow, it’s time to mix this up a bit. Similarly, don’t write anything off–there have been plenty of poems that didn’t necessarily take hold for me earlier in my life that I now count among my favorites. I suppose we bring different eyes at various points in our lives, but I’ve seen it happen time and time again. When I read Elizabeth Bishop in college, I (obviously) respected what she was doing in her poems, but it sort of ended there. It wasn’t until years later that I cracked the book open again that it struck me on an entirely different level–whereas before I was intellectually impressed with her work, now it was also emotionally and spiritually resonant. It’s worth going back to books, to poems, to writers over and over. 8. Hey Robert, what’s a favorite comic strip? 9. 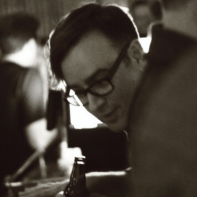 Hey Robert, got a favorite lyricist? (or musician?) Care to share a video? Like a lot of people, songwriters were my entryway into the larger world of poetry. It’s hard to narrow down the list, but the trinity of Bob Dylan, Patti Smith, and Bruce Springsteen are my go-to names (I’m sure I’m not the only one with those at the top of a list). I have vivid memories of hearing them each for the first time: listening to Dylan’s “Bob Dylan’s 115th Dream” in the back seat of our hatchback at 14, which led to a summer of getting a new Dylan album each week from June to August; hearing about Patti Smith’s Horses in an interview with Michael Stipe and buying the LP at a flea market, then sitting in my room with the record blasting “Gloria” for the first time and immediately lifting the needle to start over; checking out Darkness on the Edge of Town in 1985 to see if there was more to Springsteen than the red bandana of the mid-80s, and by the end of side 1, somehow knowing I’d be listening to this record for the rest of my life (I still have that actual LP, in fact, with the same scratch and skip in the middle of “Badlands”). Those three lyricists, while artists in their own rite, of course, led me to so much literature–Dylan to the Beats; Patti Smith to Blake; Springsteen to Flannery O’Connor. 10. Hey Robert, got any go-to revision techniques? After writing a draft, I mark up any unnecessary words, and cut. Then cut more. Cut until the bones are showing. Then, I read the piece out loud (or, at least, whisper it to myself), to see if, with all the cutting, anything needs to be added back in. There rarely is. There are other aspects of the revision process (cutting boring images, changing repetitive words, mixing up the stanza breaks, etc. ), but this is the big one for me. 11. Hey Robert, do you carry a notebook? Got a phrase dashed in there that you just can’t shake? I do keep a notebook for jotting down phrases and lines–and if I’m lucky, entire rough drafts. At the same time–as much as I hate to admit this–my phone has become the sort of receptacle for ideas these days. I’ll type in a line and save it in there; I also take a lot of pictures of things that I can tell have some sort of spark in them, so that I can remember them, go back to them later, and let them sort of get a poem moving. Scrolling through the pictures, there are countless old store signs, the tops of buildings, long shots of particular streets–when I realize I’ve started to beat a particular image or setting into the ground, I purposely try to start taking pictures of other items. I also get quick moments from songs or movies stuck in my head, and decide to just give into them, thinking there must be some way they’re waiting to push me to something. Often, I’ll wind up bookmarking clips or videos in the phone to go back to–most recently, I couldn’t shake the Tom Waits song “Jockey Full of Bourbon”–and particularly its use in Down by Law–from my head, so I wound up just keeping it on my phone and listening to it almost obsessively. It wasn’t the lyrics (although I love those, too), but the rhythm of the words–I wound up writing about five poems with that exact rhythm. Just one has made it through the other side, but still, I’ll take what I can get. 12. Hey Robert, what’s something poetic about LA? That’s the Los Angeles I love, and the one that influences my writing.